The full Democratic Party platform committee is meeting in Orlando on Friday and Saturday. Pilar Schiavo is an organizer for National Nurses United. Her work is focused on replacing private health insurance with improved Medicare through a program called Medicare for All. Schiavo stated in testimony for the DNC platform that, “the ACA had great gains: ending lifetime limits and pre-existing conditions, allowing children to stay on their parents’ insurance longer. These gains have had a great impact on Americans. Yet nearly 30 million Americans remain uninsured and just over that are underinsured because they can’t afford their co-pays, deductibles, and premiums. It’s no wonder that the majority of U.S. bankruptcies are from medical expenses. The majority of those were people who actually have insurance. “Currently inequity is hard-wired into our health care system. We continue to see wide disparities based on gender, race, age, where you live, and what you can afford. 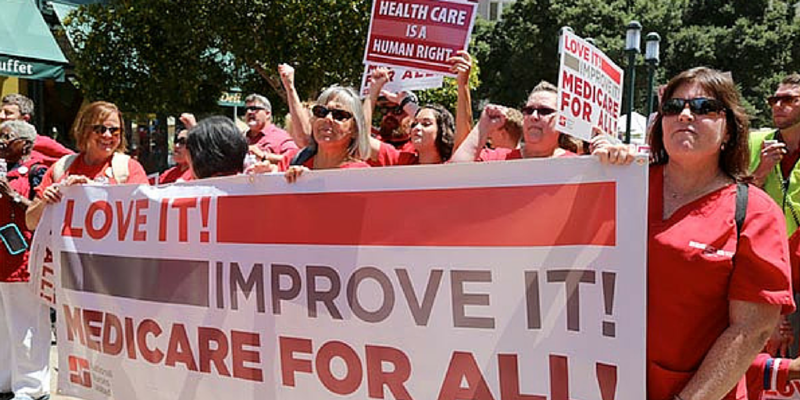 “Luckily, nurses have the cure — Improved Medicare for All. It provides a single standard of quality care, freedom to choose any doctor — while saving trillions of dollars. Plus access isn’t based on the size of your wallet. “Nurses believe you can’t put a price tag on human life — but I do want to share one key number: $1 trillion. That’s what we save with Medicare for All over 10 years. That could instead be invested in free tuition, fighting climate change, jobs and infrastructure projects. Schaumburg is an RN with National Nurses United who submitted testimony to the DNC platform in Phoenix, AZ. She spoke of her experience being an advocate for her patients, but also as a patient herself after she had to use her life savings to pay her medical bills. She also described how her health care was so costly that she couldn’t afford necessary lab work and medicine. Because of this, she had to drive to Mexico to get affordable care. She can now afford to see a doctor, pay for her medication and get her required lab work and tests at one-fifth what she would pay in the United States — and that is keeping her alive.